A number of building sites across Co Wicklow have been sealed off over fears they may be contaminated with naturally occurring asbestos, a cancer-causing mineral, contained in material from a local quarry. Ballinclare Quarry in south Wicklow has been closed after testing last month uncovered the presence of naturally occurring asbestos in the stone it produces. Potentially contaminated material from the quarry was supplied to a number of construction sites before the problem was identified during routine testing, according to its owner, Kilsaran Group. As a result, temporary covers have been erected over seven sites that may contain hazardous material, the company says. The sites include family homes under construction and larger construction projects. The company has put in place a programme to test and remove any contaminated products from the affected sites. Some are in Greystones, where housebuilder Wood Group Homes says it was informed of the issue by Kilsaran on May 25th. It says Kilsaran advised that stone aggregates supplied from the quarry to sites between April 19th and May 12th “may have been contaminated with small fragments of naturally occurring asbestos”. Wood Group says it took immediate action by notifying the relevant authorities and informing staff of the potential hazard. The suspect material has been identified, isolated and temporarily covered to ensure there is no risk to staff or the public. A spokesman said Wood Group has appointed its own technical, health and safety advisers to oversee the removal of material and ensure this work is independently verified. “At the time of writing, preliminary airborne contaminate tests have been conducted at and around the suspect material and all tests have returned negative for contaminates,” he said. Asbestos can cause lung disease or cancer and is banned as a building material. It becomes dangerous when its fibres are released into the air. Its removal from older buildings can trigger health fears. The Health and Safety Authority said it was notified a thin seam of naturally occurring asbestos rock was “inadvertently disturbed” during a blast at the quarry. Subsequent to this, blast material was processed and sold on to a number of local sites. All of these sites have now been identified, a spokesman said. Inspectors visited the quarry and affected sites this week to check on containment work and were satisfied any risks to workers were currently being managed, he said. Remediation works started on Friday at one of the affected sites and all other sites will be addressed over the coming weeks, according to the authority. 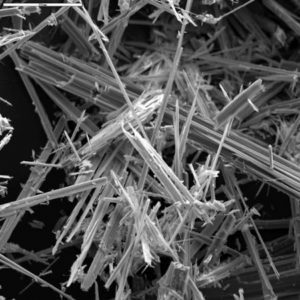 The Environmental Protection Agency said the HSA and Wicklow County Council are dealing with the aftermath of a blast at the quarry that hit a seam of asbestos-bearing rock. “The agency is in contact with these two bodies and will assist or provide advice as necessary,” a spokeswoman says. Kilsaran bought the quarry from a receiver almost four years ago and continued the existing practice of excavating material from the northwest of the site. In April, it demolished buildings on the southeast of the site and blasted the ground underneath. This rock was later found to contain actinolite, one of the mineral forms of asbestos. Construction Products, Dept of Environment: see here. This entry was posted in Building Regulations on June 7, 2016 by BRegs Admin. After the Pyrite scare, or before it, were there not mandatory sample requirements? Please don’t retort with ‘its not the governments job’ nonsense. It is the job of government to legislate, regulate, monitor and enforce. We have all been gulled by these nonsense memes from America and Thatcher’s Britain about self-regulation, light regulation and self-certification. You might get away with such nonsense where there are no serious or fatal consequences when something goes wrong. Banking and Building are lightly regulated, self-regulated and self certified areas where consequences can be both serious and fatal. The track record in both industries is poor. Its past time they got on with it!